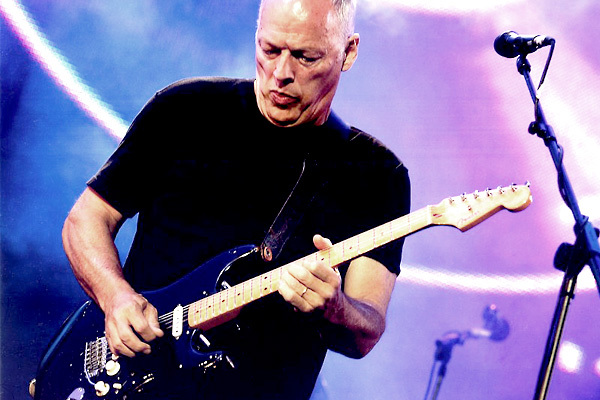 Pink Floydâ€™s triumphant reunion at the Live 8 show in Londonâ€™s Hyde Park in 2005 was not only a burying of old war hatches but also the return of Davidâ€™s legendary Blak Strat. The short 4-songs performance saw Pink Floyd give their best for the last time and Davidâ€™s solos and tones has almost never been peformed with such authenticity to the original versions. Note: Itâ€™s hard to tell just what the rack included. Judging from photage from the show itâ€™s clear that itâ€™s a scaled down version much like the On an Island live setup. The MXR Digital Delay and UniVibe was however used for the performace. The pedal board dates from 1999 and was requested by David to be used for future guest appearances etc. The board featured Cornish custom tube preamps between each effect to ensure minimum signal loss. It could also perform in both stereo and mono. Additionally the board was designed not to allow two distortion pedals to be engaged at once, only distortion+overdrive. The board was later used for the 2006 On an Island recording sessions and 2010 guest appearances. David with the Black Strat. This was the first time he used it on a stage since the 1984 About Face tour. – 1969 black alder body with black pickguard, Fender â€˜57 reissue maple neck and Fender â€˜71 neck and bridge pickups and a Seymour Duncan custom SSL-1 bridge pickup. – Blonde with stock Fender pickups and an open G chord tuning (D G D G B E) for Breathe. – EMG and Crown pickups with separate outputs. – With Mullard 4xEL34â€™s power tubes and 4xECC83â€™s pre-amp tubes. Modified for linked normal and brilliance inputs. The third head is a backup. – with 4Ã—12â€ Celestion G12M speakers. Note: David is also seen using the candy apple red 1983 Fender â€™57 reissue Stratocaster at the rehearsals but Phil Taylor insisted that David should use the Black Strat. Tim Renwick is also seen using Davidâ€™s cream 1983 Fender â€™57 reissue Stratocaster during the show. (left) David playing a blonde Fender lap steel. This one replaced the old blonde Jedson. It was actually the first time David performed the slide solo live. Earlier 1973-75 live versions featured a guitar solo played on the Black Strat and in 1994 Tim Renwick played slides on his Stratocaster. 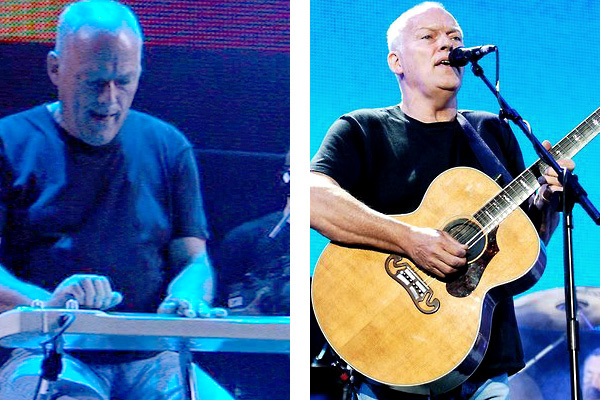 (right) David with the Gibson J-200 Celebrity while performning Wish You Were Here. The Black Strat and Fender lap steel were strung with GHS Boomers (custom set 0.10-0.48) and the Gibson acoustic with Ernie Ball Lightwound strings. All guitars were hooked up with Evidence Audio instrument cables. See these in-depth features for more on Davidâ€™s gear: Big Muff, The Black Stratocaster, Slide Guitars and Hiwatt amps & WEM cabinets. Live 8 (concert film 2005), tonefromheaven.com and â€œThe Black Strat â€“ A History of David Gilmourâ€™s black Fender Stratocasterâ€ by Phil Taylor. See feature for other references.